Beginning with our 50th Anniversary in 2013, the Board of Directors decided that every five years the organization should celebrate the organizations accomplishments and the talents of our craft artists. To celebrate our 55th Anniversary, this tradition was continued with the announcement of eighteen new Life Members at the Annual Meeting on November 18th. Each of these artists have maintained their membership for the past 45 years or longer. With their strengths and vision, our organization grew and became the benchmark for excellence that it is today. Oz and Pat Mauck - for over three decades of volunteering at the Piedmont Craftsmen's Fair. Congratulations to these new Life Members! 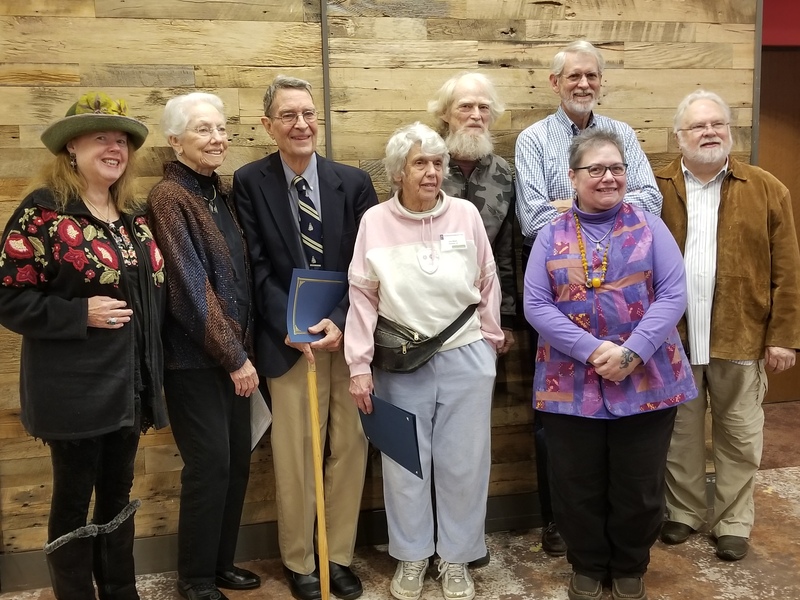 Pictured above, from left to right: Lynn Hope McNees-Sams, Pat Mauck, Oz Mauck, Lucy Moore, John Nygren, Susannah Ravenswing, Winthrop Schwab, and Ron Propst.